On the 1st May 2016 the Australian Government announced $15 million in funding over two and a half years to develop the National Carp Control Plan to undertake further research, approvals, and consultation to develop a comprehensive plan for a potential release of Cyprinid herpesvirus (carp herpesvirus) by the end of 2018. A National Coordinator will work with stakeholders from across governments, industry, community and environmental groups, and research organisations to understand the issues and bring together a comprehensive plan, underpinned by research, risk assessment and a sound understanding of community views. The plan will focus on maximising the reduction of carp populations while minimising disruption to industries, communities and the environment should a carp herpesvirus release go ahead. They breed like rabbits and put increasing pressure on our waterways and native wildlife. Yep, we’re talking about carp. Just like rabbits these pesky fish multiply rapidly, reaching huge numbers quickly and are one of the most invasive and damaging pests of our freshwater ecosystems. 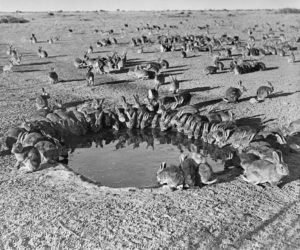 Biocontrol agents have been successfully used to control rabbits in Australia, and we’re confident that a virus that has been killing carp overseas could do a similar job here. This virus, once known as koi herpesvirus, is now formally known as Cyprinid herpesvirus 3 (CyHV-3). Seven years of CSIRO research, supported by the Invasive Animals-Cooperative Research Centre (CRC), has shown that the use of CyHV-3 as a biocontrol agent could significantly reduce the number of common carp (Cyprinus carpio) in our rivers. Naturally with any talk of a biocontrol agent, there is public debate and speculation. So we thought we’d go fishing for answers to the most common questions. 1. Is it really necessary to control carp in Australia? First introduced in Australia in 1859, carp became a major pest in the 1960s after the accidental release of a strain that had been adapted for fish farming. Within a few years they established themselves throughout the entire Murray-Darling Basin. 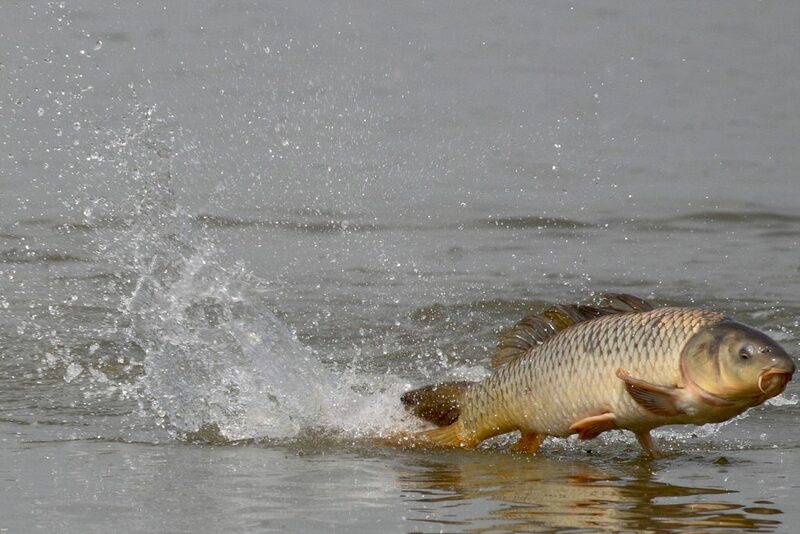 Carp now comprise up to 90% of the fish biomass in parts of the Basin. This is largely attributed to female carp producing up to a million eggs per year, and to the omnivorous fish’s tolerance for a wide range of habitats including degraded water. While we may not be able to ‘prove’ that carp directly caused the degradation of our rivers, their dominance must certainly contribute to the problem. It is unlikely that the Murray-Darling Basin could ever return to its previous glory while carp remain in such high numbers. Our views in Australia are supported by research from the US. This showed that carp muddy their waters resulting in flow-on effects on plants, invertebrates, bird-life and native fish in shallow lakes. Researchers concluded that common carp damage the ecology of shallow lakes, particularly when carp density reaches levels similar to those in parts of the Murray-Darling Basin. 3. What happens to the dead carp? 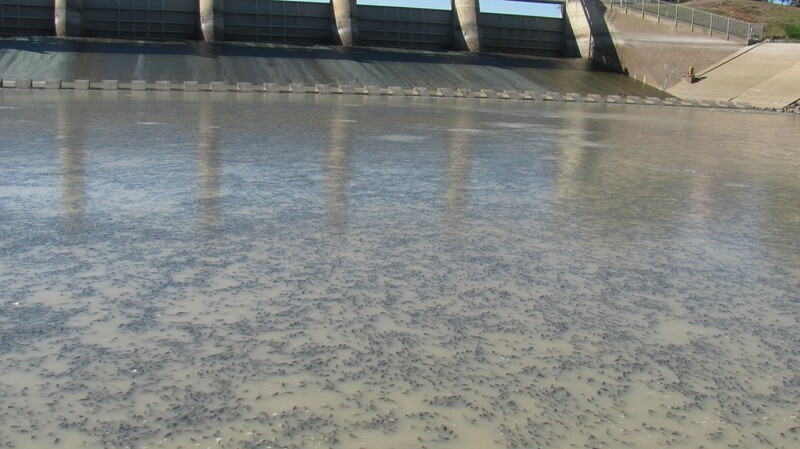 Juvenile carp aggregated below the Menindee Main Weir on the Darling River. Image: Nigel Harriss, NSW Office of Water. If an image of rivers full of large dead carp floating on the surface is what springs to mind, rest assured that our research includes careful planning and modelling before release and follow-up strategies are recommended. 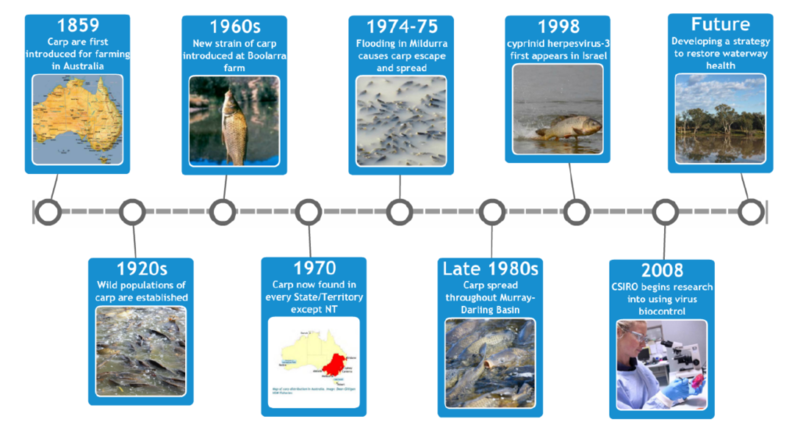 Carp breed in well-mapped specific sites along the Murray-Darling Basin. The virus is likely to be released in these sites where most carp are juveniles. Not only would this wipe out large populations of carp before they become mature, but bird life will probably clean up large numbers of the immature carp. Study tours of Japan and Indonesia are part of the Invasive Animals-CRC program to study natural outbreaks of CyHV-3. Researchers will be reviewing the significance of dead mature fish, and strategies for dealing with them. Given our very good understanding of both the biology of CyHV-3 and of carp in Australia, we are optimistic that this carp virus will make a significant impact on carp in this country. And for that, our river systems and native fish will be very grateful. Your questions came in thick and quick when you heard we’re working on a biocontrol option for managing European carp numbers in Australia. We’re not fishing around – we take biocontrol research seriously. So, we sat down with our resident koi carp expert Ken McColl to answer all your burning questions. Can the virus live outside the carp body? The virus survives for only a few days outside a fish. Will the infected fish be safe for animals and people to eat? CyHV-3, which was first discovered in Israel in 1998, has devastated carp farming around the world yet despite the large numbers of people working on these affected farms, there has been no evidence of any effect of the virus on them. We have also exposed mice to CyHV-3, and found no evidence of disease. Mice were chosen as being a representative mammal, just like a human. Finally, a report to the European Commission by the Scientific Committee on Animal Health and Animal Welfare stated that there is no evidence of ANY fish virus causing disease in humans. Rabbit numbers have been considerably reduced by the introduction of two viruses – Calicivirus and Myxoma. What will happen to ornamental fish bred intentionally, are they likely to be infected eventually? Also, any new fish introduced to an aquarium should be held in quarantine – about two-four weeks for koi (which could be incubating the virus) and any also for other species that may have had contact with carp/koi (they could be inadvertently carrying the virus on their gills or skin even though it will not cause disease in these species). So there will be a lot of dead carp floating around? The release would be coordinated at a location and time that coincides with breeding, so it would initially kill young fish before spreading throughout the waterways. The dead fish will be an easy food source for many bird species, and in addition will still be able to be harvested for fertilizer. When will the virus be released? It is difficult to place a timeline on any biocontrol program. We’ll continue to undertake studies with non-target fish species to ensure the virus remains species specific and only affects carp. Following this, the Invasive Animals CRC (funding body) will work with the relevant parties to progress the biocontrol agent through the regulatory/approval processes. For more information on biocontrol of invasive species, visit our biocontrol page. Wipe the pests out,sooner the better.I am born and bred in the Riverina.Lived on the Edward river,to see this problem and to what they do,no option.Wipe them out. I would like to know what the Australian Koi Society, and breeders have to say about this, when their ten,s of thousands of dollars of prized fish could be killed…. This is very, very good news! I’m over dragging these smelly buggers out of the Murray! I am not a scientist involved in studies related to this subject. But I am always against to introduce anything to kill an introduced species. I know that at the moment we know that the virus does not affect other specie. But what about mutations, or mutations to other organisms that we are not considering? I know that there are several studies to manage the carp population, and I believe that a reliable method that does not involve the introduction of virus would be found.